So there’s this thing called a bathroom in our house that is just begging for a change of pace. Well guess what bathroom? I have some major plans for you! By major I really mean minor because I’m not willing to dish out a lot of dough. Unless it’s donut dough, in that case I’ll be willing to dish out plenty, providing I get to indulge in one… or two, or nine. All dough aside, I assembled this inspiration board without paying any mind to money. This is just what I dream of, besides the marble tiles, for this room. The truth of the matter is, my shopping list will look completely different because $187 for a light just isn’t my thing at this moment in time. Remember, we’re in limbo and don’t want to spend a lot of money on this place if we won’t be able to buy it. So with that in mind, let’s talk about this mood board. 1. First thing on the list is this $187 light I was talking about. I can totally picture it installed over our medicine cabinet. Besides being more than we’re willing to spend, my better half isn’t fond of it, so now I’m leaning more towards this outdoor light from Lowes instead. 2. I already have a quart of Medium Gray paint on hand, which I got for free thanks to Ace Hardware’s free paint promotion (which is also going on this Saturday). A quart should be plenty to cover the walls in our small bathroom, but I may pick up another quart to paint the ceiling. Don’t take my word on it though, I still haven’t decided, and my arms are already sore from holding my teething beauty all day. 3. Bathrooms don’t have to be just strictly business. Fun accessories like this gold sphere from West Elm would look great on bathroom shelves. 4. Speaking of shelves, I’ve decided to replace our standard metal shelf with rustic wood shelves. These shelves from We Live Here’s blog are definitely inspiring. 5. I couldn’t have a bathroom makeover without bringing towels into the picture. I’m eager to replace my collection of multicolored towels with some simple white ones. I also need to downsize our towel collection because really, does my family of five really need twelve towels? 6. This might sound a little crazy, but I really like the idea of using a doorknocker as a towel ring. What do you think? 7. These soaps from Kehoe Natural’s aren’t only functional, but also pleasing on the eyes. After all, who says bar soap can’t be pretty? Plus they are all natural, and I’m not talking about manufactured in a laboratory all nature, they’re the real deal. 8. I have a love-hate relationship with bathroom rugs, probably due to the fact that if I don’t wash our white bath mat weekly it begins to resemble a grayish-brown rug. A black bath mat wouldn’t flaunt dirty pre-bathed feet as loudly as a white rug, which is okay with me. Don’t worry, I’d still wash it… maybe. 9. I couldn’t decide between these two coat hooks, so I decided not to decide. That makes sense, right? 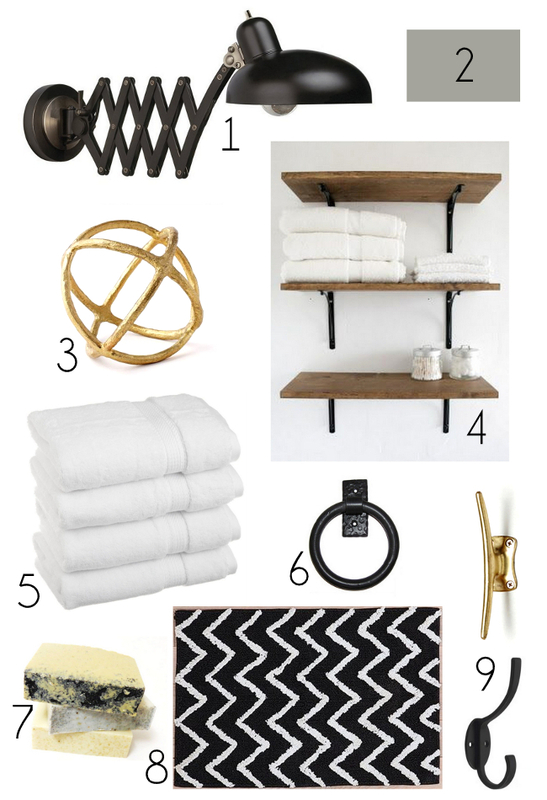 The gold one is from Antropologie and the less expensive black one can be found at Lowes. I’m drooling over the gold hook’s lines but am drooling more over the black hook’s price tag. So tell me, what have been inspired by lately? To see what else I’ve been inspired by lately, you can follow me on Pinterest or “like” Turning It Home on Facebook. I'd love some insight from you on my space! Me too!! I also love your mood board, it's a great idea. I've also got a love-hate relationship with bath rugs. I've ended up with a thin turquoise one from IKEA. It's perfect even though I don't love the pattern on it. Thank you so much for sending to me that hook, I love it! You're living room is such a great space, I'm looking forward to seeing what you end up doing with it! Is there a such thing as too much fun? Haha! I've started to feel overwhelmed as well (it doesn't help the baby is having a rough week!) but I try to remind myself that I don't need to complete everything is this time frame and to not over extend myself, or I'll end up bitter about it. About the soaps, I can now see a slight resemblance to blue cheese but I am also hungry! Deciding on a paint color is one of the most difficult decisions, but then again I'm horrible at making decisions!